There's chaos and then there's collateral effect. What happens when you bring both the entities together? It becomes a disaster. 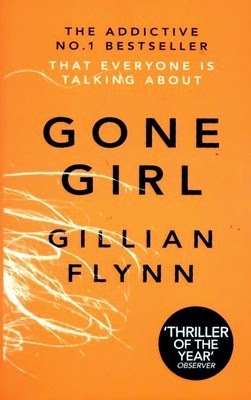 Author Gillian Flynn in her book "Gone Girl" has tried her hands on creating a man made disaster which brings a long chaos of the highest order and collateral effect of a harmful nature. So has she been able to recreate a picture perfect book? Let's find out. THE ADDICTIVE No.1 BESTSELLER THAT EVERYONE IS TALKING ABOUT.Who are you?What have we done to each other?These are the questions Nick Dunne finds himself asking on the morning of his fifth wedding anniversary, when his wife Amy suddenly disappears. The police suspect Nick. Amy's friends reveal that she was afraid of him, that she kept secrets from him. He swears it isn't true. A police examination of his computer shows strange searches. He says they weren't made by him. And then there are the persistent calls on his mobile phone. So what really did happen to Nick's beautiful wife? First look at the title and the cover and there's nothing to talk about. It's a pale and a pretty dull cover for the thriller. The title itself tries to speak volumes about the book but it allures away from the honest truth. The blurb is short and sweet and keeps readers interested with a girl gone missing and people in question and the nature of the conspiracy. The story is of Nick & Amy Dunne, a happily married couple whose lives are turned around when they lose their jobs respectively and have to move back to Missouri. Nick struggles to make ends meet and keep the sanctity of the marriage alive with the help of Amy but it doesn't bears a healthy fruit. When Amy disappears on their fifth anniversary from their house under mysterious circumstances, Nick's world comes crashing down. The sleepy and recession hits town comes alive as it becomes a cat and mouse game and brings together locals, police and Amy's loved ones to determine the fate of the girl. So what happened to Amy? Will Nick be able to shun the suspicion and co-operate with the police? Will Amy return or has she gone for good? This is what the story is all about. The thriller works around a chaotic environment and feeds on the fears and darker sides of the characters. Along the lines a hidden trails guides the story and it helps to churn out the best suspense and drama to waiver readers off the line. The slightest scent and whiff of what's going to happen next has been devoured and the past and the present has been jumbled and scrambled across the entire book to come up with the thriller. The idea works and gels well with the perspective of both Amy & Nick in place. A psychotic finish to the characters and constant clammering too makes it a frenzied book. There's a no rush attitude and everything thrown at the reader is done with a careful selection of words. The downside of the book is its pale second half which fails rather unceremoniously and gives up on the story too soon. The long handled extension required to keep the story alive goes missing and the thrill takes a back seat. The end too falters and gives up on the story. There are times when too much dragging of events have happened and the story looks like a hapless soul being dragged to his grave. Toning down of few events would have shortened the length and given it a better perspective. It tends to go overboard quite a few times and makes it look a touch too boring. All in all the book is a sugary-spicy narrative and has both dark and secretive sides to it. It pounces on the limited freedom with fervor and churns an out of the box idea but fails to deliver the goods as required. The book demands attention and manages to gain it too but at the behest of some unwanted elements and over the top events. But the fact that it does gives goosebumps makes it a picture perfect idea to read and rummage through it once. It's certainly a book with a difference.